Washington DC hotels are renowned for their world class comfort and amenities, providing guests with top of the line service that leaves them wanting for nothing. Whether in town for business or for pleasure, these hotels make their guests feel like they are home, providing them with opportunities to relax and work as they please, without having to worry about their personal needs or concerns. 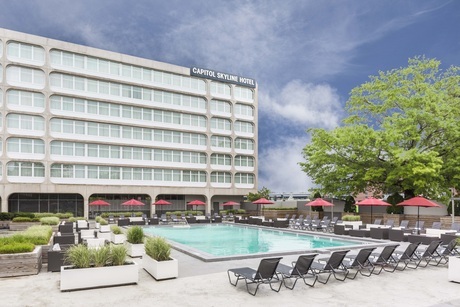 Located near the city's baseball stadium and offering free Wi-Fi the Capitol Skyline Hotel is a hit with our guests who are fans of fun and funky mid-century modern decor. With 203 rooms on seven floors this 1961 hotel was treated to a head-to-toe makeover in 2009. The lobby is a welcome surprise with South Beach-style furnishings in eye-catching shades of red and orange. The lounge continues the theme with its low-slung leather couches intended for kicking back. The sunny outdoor pool large enough to host Olympic events is a perfect place to cool off during the summer months - as is the poolside bar. Accommodations are designed for work and play with both a spacious desk and a flat-panel TV. Complimentary Wi-Fi in the rooms and public areas means you can stay connected. Nationals Park home of the Washington Nationals baseball team is four blocks south. Arena Stage one of the country's best regional theaters is five blocks west. The U.S. Capitol is a 20-minute walk and the National Air and Space Museum is about 25. The Navy Yard and Waterfront stations of D.C.'s speedy Metro system are both three blocks away so you can reach more far-flung attractions in no time. Because the hotel has easy access to the highway - I-95 is a block north - you can drive the five miles to Ronald Reagan National Airport in about 12 minutes. our guests appreciate the Capitol Skyline Hotel for its "comfortable" rooms "very good staff" and a location that's "a 5- to 10-minute walk from the metro station for easy access to the city center." Fine French cuisine in-room spa services and a central location heighten the value factor at The George a Kimpton Hotel a hip non-smoking property located near Capitol Hill. This pet-friendly hotel has eight floors and 139 rooms with plush mattresses and 300-thread-count Egyptian cotton sheets. Flip on the 32-inch flat-panel TV or groove to your own soundtrack thanks to the iHome docking station. You can get busy at a granite-topped work desk and ergonomic chair. Rooms also feature DVD players laptop safes luxurious marble bathrooms and free newspapers. Hungry guests please their palates with fine French cuisine at the on-site bistro. Early birds and night owls address their workouts and work responsibilities at the 24-hour fitness center and 24-hour business center respectively. Stay in and relax with in-room spa services and in-room yoga services. You can mix and mingle over reds and whites at the free wine reception. Valet parking is available for a fee. Located in Capitol Hill The George is a half-mile from the Union Station Metro station and four miles from the Judiciary Square Metro station. You can check out the staggering art collection at the National Gallery of Art a half-mile away. Bibliophiles pay homage at the Library of Congress one mile from the hotel. Take a tour of the White House less than three miles away. It's six miles from Ronald Reagan Washington National Airport and 31 miles from Dulles International Airport. A location "close to the Metro" an on-site bistro and plush bedding please our guests at The George a Kimpton Hotel. A modern boutique hotel set in a 19th-century marble building downtown the non-smoking pet-friendly Kimpton Hotel Monaco Washington DC is a unique find within walking distance of the capital's top attractions. Despite its landmark setting in the 1839 Tariff Building the atmosphere at the Monaco is anything but stuffy. From the soaring ceilings to the eclectic and colorful furnishings the 183-room hotel provides a vibrant backdrop for a business or leisure stay. Guests enjoy complimentary morning coffee and hosted evening wine receptions in the lobby as well as a brasserie menu and impressive wine selection at the adjacent restaurant which offers 24-hour room service. Pets are also treated to special goodies and are welcome at no additional charge. Rooms feature vaulted 20-foot ceilings cable TVs plush robes and upscale toiletries honor bars with gourmet goodies and access to a menu of in-room spa treatments. The Monaco also features a 24-hour business center a third-floor fitness room with floor-to-ceiling windows and valet parking for an extra daily charge. The Monaco is in Washington's Penn Quarter district across from the Smithsonian National Portrait Gallery and just steps from the Verizon Center the International Spy Museum and the National Mall. The hotel is one block from the Gallery Place/Chinatown Metro station and five blocks from the Metro Center station. Ronald Reagan Washington National Airport is five miles away and Washington Dulles International Airport is 27 miles. our guests say that the "absolutely gorgeous" Monaco features a "great" location "within walking distance" of the National Mall shopping restaurants and bars as well as an "amazing" "well-trained" staff. Located near Dupont Circle minutes from Washington D.C.'s most famous sites this all-suite hotel provides many free amenities along with spacious accommodations complete with many of the comforts of home.The Embassy Suites Washington D.C. is ideally located within walking distance to a Metro (underground) station. This location allows guests instant and easy access to many areas of the city including the White House the Lincoln Memorial and historic Georgetown.Guests at the Washington D.C. Embassy Suites can take advantage of in-room kitchenettes complete with refrigerators and microwaves. The hotel also offers a free hot breakfast as well as a free nightly reception.The Foggy Bottom Metro Station and Dupont Circle Metro Station are both 7 minutes' walk from this hotel. Impeccable service regal style and a rarefied atmosphere make The Mayflower Hotel Autograph Collection one of the most popular hotels among our guests in Washington D.C. Its location a few blocks from the White House is almost gilding the lily. The grande dame Mayflower Hotel A Marriott Luxury & Lifestyle Hotel has been a local landmark since 1925 and it welcomes visitors with a seemingly endless lobby with hundreds of gilt-edged medallions decorating the ceiling. Off the lobby is a restaurant and bar and there are shops selling everything from flowers to designer duds. Sneak a peek at the grand ballroom lined with balconies on either side which hosted inaugural balls for presidents from Coolidge to Reagan. The hotel's 571 rooms are spread out over 10 floors in the rose-bricked Beaux Arts building. The pillowtop beds are wrapped in luxe linens and the bathrooms are stocked with high-end toiletries. There are both wired and Wi-Fi connections for a fee and the expansive fitness room has lots of cardio and circuit-training equipment. The Mayflower Hotel is on Connecticut Avenue a favorite shopping strip for locals. Three blocks north is Dupont Circle perhaps the prettiest of the city's pocket parks and surrounding it in every direction are eateries ranging from sidewalk cafes frequented by students and young families to reserve-months-ahead restaurants where you might spot D.C.'s movers and shakers (and occasionally the President). You're five blocks from the White House and about seven from the Washington Monument. The city's futuristic Metro system is close at hand—the Farragut North station is just down the block. Ronald Reagan Washington National Airport is five miles away. One of the city's best addresses The Mayflower Hotel Autograph Collection is near the best sights shopping and dining. Its refined and polished service makes it a winner. A friendly boutique hotel the non-smoking Kimpton Glover Park Hotel offers great value close to Georgetown. The Kimpton Glover Park Hotel has stunning views of the city skyline from most of its 150 rooms and suites all equipped with premium mattresses 37-inch flat-panel HDTVs with HBO and Showtime. Homelike amenities include coffeemakers hairdryers and ironing equipment. Business guests appreciate the large work desks Wi-Fi access and programmable safes for storing laptops. Handicap-accessible rooms are available and select rooms feature full kitchens ideal for families and extended stays. Guests enjoy free transportation to the Metro and Georgetown University. The Kimpton is in the affluent Glover Park neighborhood surrounded by parks embassies restaurants and the U.S. Naval Observatory. The hotel is about one mile from both Georgetown University and Washington National Cathedral. Ronald Reagan Washington National Airport is six miles from the hotel and Washington Dulles International Airport is 26 miles away. our guests say the "quiet" "well-maintained" Kimpton Glover Park Hotel offers "comfortable" beds and an "excellent location near all of downtown Georgetown." A hotel restaurant and lounge an indoor pool and a 24-hour fitness center keep our guests coming back to the non-smoking Hilton McLean Tysons Corner conveniently located off I-495. The high-rise non-smoking Hilton offers 458 rooms with flat-panel TVs with premium cable coffeemakers desks clock radios with mp3-player connections and Wi-Fi for a fee. Savor your choice of options from the breakfast buffet at the hotel's restaurant dine there for lunch or dinner or order room service. The hotel lounge offers cocktails light fare and live music on select nights. Guests can work at the business center and work out at their convenience at the 24-hour fitness center. The property also includes an indoor pool ATM and a 24-hour convenience market. Parking is free. Located off I-495 south of Dulles Toll Road the Hilton McLean is 15 miles outside Washington D.C. It is within a 15-minute walk of the shops and restaurants of Tysons Galleria. Interstate 66 is four miles south. Ronald Reagan National Airport and Washington Dulles International Airport are both 15 miles away. our guests like the Hilton McLean's "beautiful" lobby "comfortable" beds "awesome" staff and "great" location near Baltimore and D.C.
With a stunning entrance and lobby elegant furnishings and attention to detail The Fairfax at Embassy Row in Washington D.C gives our guests a taste of living like a head of state. The eight-floor Fairfax at Embassy Row offers flat-panel TVs sumptuous beds and plenty of space to work or lounge in all 259 rooms and you'll also find nice touches such as a free newspaper each morning and bathrobes and slippers in the closet. High-speed internet access is available for a fee. The clubby on-site restaurant serves all-natural American chophouse cuisine and the power drinks of Washington D.C. — cosmos and martinis — plus a whole lot more. The elegant bar is just the spot to do some unobtrusive gawking as guests famous and not pass by. The business center has whatever you need 24/7 for work while you're on the road and the concierge can help you with reservations to the nearby restaurants of Dupont Circle and Georgetown. Parking is available for an extra charge. The Fairfax is a stone's-throw from the embassies that line Massachusetts Avenue NW. Dupont Circle is less than two blocks away. Georgetown one of Washington's finest neighborhoods is just over a mile away. The National Mall and Smithsonian museums are two Metro stops away. Ronald Reagan Washington National Airport is six miles from the hotel and Washington Dulles International Airport is 27 miles away. our guests love the pampering the sophistication the "excellent accommodations" and the convenience of The Fairfax at Embassy Row. Courtesy shuttle service a pool and hot tub and on-site dining please guests at the non-smoking Marriott Tysons Corner. The high-rise non-smoking Marriott houses 396 rooms all with flat-panel TVs and coffeemakers. Wi-Fi is free in the lobby and available for an extra charge in rooms. Relaxation is what it's all about at the indoor pool and hot tub. Enjoy a drink or grab a bite at the coffee shop lounge or restaurant. Stay in touch at the business center and stay in shape in the 24-hour fitness room. A courtesy shuttle service rounds out the amenities and self-parking is available for a fee. Shoppers are in paradise at this Marriott which is within walking distance to the Tysons Corner Center. Wolftrap Center for the Performing Arts is just five miles away. Arlington National Cemetery is a 10-mile drive from the property the National Air and Space Museum is 15 miles away and the Mount Vernon Estate is 20 miles from the hotel. Dulles International Airport is 15 miles away. our guests "love the atmosphere" at the Marriott and also speak highly of the hotel's "comfortable and well-appointed" rooms "very friendly" staff that "goes out of their way to help" and an "outstanding" breakfast. A newly expanded lobby make the all-suite non-smoking Sheraton Suites Old Town Alexandria a welcoming home base for our guests. The 10-story Sheraton Suites features a lobby that emphasizes social interaction and high-tech connectivity. You'll find a variety of flexible seating areas plus Wi-Fi access and complimentary PCs. All 247 of the hotel's suites feature classic French doors separating living and sleeping areas. Accommodations also include beds with premium mattresses and luxurious linens mini-fridges microwaves coffeemakers and flat-panel cable TVs with premium channels. In-room Wi-Fi and wired high-speed internet access are available for an additional daily fee. Select suites have balconies with river or city views. When hunger hits visit the restaurant and bar for fresh American fare and creative cocktails. If it's after-hours you'll want to hit up the 24-hour marketplace. There's also an updated fitness center and covered parking is available for a daily charge. Airport transportation is free. Sheraton Suites is located off Route 400/George Washington Memorial Parkway in historic Alexandria less than six miles from the Pentagon and the National Mall in Washington D.C. The hotel is within walking distance of Old Town's art galleries boutiques and restaurants and within one mile of business locations such as United Way of America the American Academy of Physician Assistants and the International Association of Chiefs Of Police. Ronald Reagan Washington National Airport is four miles away. our guests say the Sheraton Suites is "a great hotel in an all-American city" boasting a "very convenient location" "superb" staff and "beautiful" "spacious" rooms. An indoor-outdoor pool free Wi-Fi and a modern fitness center combine to make the non-smoking Key Bridge Marriott a standout. One of Arlington's most popular hotels among our guests the 14-story Key Bridge Marriott was completely renovated in 2009. It has an open and airy lobby with plenty of quiet corners to laugh with friends or meet with clients. There's free Wi-Fi in the public areas. Fluffy towels are piled up at the indoor and outdoor pool and the hot tub. There's also a sauna and a fitness room with cardio and strength-training equipment. The pillowtop mattresses in all 582 rooms are dressed with 300-thread-count linens and down comforters. Rooms are sumptuously furnished. Up-to-the-minute amenities include 37-inch flat-panel TVs with instant access movies and panels where you can plug in your favorite electronic devices. The on-site restaurants serve breakfast lunch and dinner and room service is available. Parking is offered at a daily rate. The Key Bridge Marriott is a short stroll from Georgetown one of D.C.'s most popular dining districts. Five blocks south is Metrorail's Rosslyn station so you can get practically anywhere in the area in minutes. I-66 is near the hotel so you can get on the road in no time. Ronald Reagan Washington National Airport is five miles southeast while Washington Dulles International Airport is 24 miles northwest. our guests are "beyond impressed" with the "inviting" Key Bridge Marriott saying they're "thrilled with the pool" and the "lovely clean comfortable and quiet rooms." A colorful and edgy boutique hotel with on-site dining the non-smoking Mason & Rook a Kimpton Hotel welcomes sophisticated business travelers as well as young families with kids and pets in tow. Mason & Rook sets the stage for fun and relaxation with styling that's a clever nod to both the country's founders and the game of chess. In the lobby the hotel provides complimentary morning coffee and a hosted wine hour every evening. Other amenities include in-room dining and spa services a 24-hour business center a gym and concierge service. All rooms feature flat-panel LCD TVs with premium cable channels spacious work desks platform beds with European linens fully stocked organic minibars plush robes and hairdryers. High-speed internet access and indoor valet parking are both available for an additional fee. Pets enjoy special treats and are permitted at no additional charge. Mason & Rook is located in the Logan Circle neighborhood of downtown D.C. within six blocks of two Metro stations. Dupont Circle and the hip restaurants and boutiques of the Adams Morgan neighborhood are within one mile of the hotel and the White House the Corcoran Gallery of Art and George Washington University are less than two miles away. The Helix is five miles from Ronald Reagan Washington National Airport and 26 miles from Washington Dulles International Airport. our guests report that the "very unique" "unforgettable" Mason & Rook a Kimpton Hotel offers "great style" "huge beautiful rooms" a "very friendly staff" and a wonderful location "close to lots of bars and restaurants."